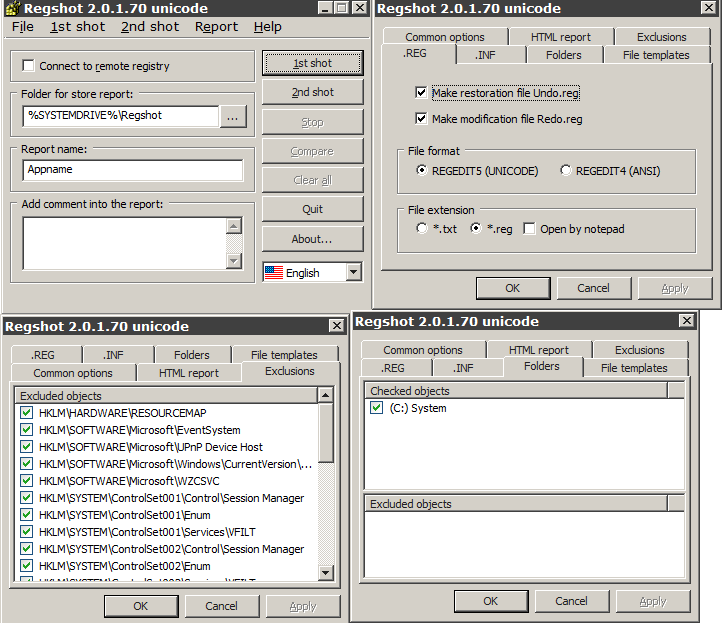 Regshot2 Unicode is a registry change and file system change detection diff tool that takes snapshots, generates HTML reports, and creates automatic REG undo/redo scripts. The program can save/load snapshots to file for later use, while registry path and file path inclusion/exclusion rules can be set to include/exclude paths in the snapshots. Registry Shot - It will automatically generate UNDO.REG and REDO.reg registry scripts based upon the difference between two snapshots taken at two points in time. Note: Regshot2 Unicode is not an update to Regshot, but a unique program. Although it shares a similar interface, it is a code fork by a different author and has many more features. How to extract: Download the ZIP package and extract to a folder of your choice. Launch Regshot.exe. Download links appear to be dead. DVDsig was created to scan all files in a directory structure to verify files burned to a CD or DVD, but can also monitor a local folder and subfolders for changes. The program uses the MD5 checksum algorithm. How to extract: Download dvdsig.exe to a folder of your choice and launch. Can't find what you are looking for? This list shows entries with Files - Change Detection as a supplementary function. You can view more entries with Files - Change Detection as a primary function.